Netorigin Review 2019: Is Netorigin a Good Hosting? Netorigin is an Australia-based hosting provider established in 2010. The vendor focuses on the provision of managed WordPress hosting, shared web hosting, reseller hosting, and VPS hosting solutions for SMEs in Australia. Netorigin is a web hosting provider based in Australia. It offers an array of hosting-related solutions, including SSL certificates, email hosting, domain name registration, shared web hosting, reseller hosting, and VPS hosting. Its data center is located in Perth, Australia. Netorigin uses enterprise-grade SSD storage in its servers. This ensures that the websites hosted load up to 20 times faster than those websites hosted on traditional HDD servers. The vendor’s hosting servers use isolated containers technology to deliver better security to its clients’ websites. It uses LS cache, an in-built caching which is optimised for WordPress solutions. What’s more, Netorigin performs nightly offsite backups and offers a free backup restoration solution. While this hosting provider offers SSL certificates, they are not free and are not included in any of its hosting plans; users have to pay for them as an add-on. The company provides 256 bit SSL certificates from popular provider Comodo. Available certificates include PositiveSSL, PremiumSSL, Wildcard SSL and Premium EV. Netorigin provides competitive prices for all of its hosting plans with no apparent hidden charges or significant restrictions. The prices are displayed in dollars. The vendor offers one billing cycle where clients make monthly payments, along with a 30-day money–back guarantee where dissatisfied customers get 100% of their money back. The hosting firm offers an uptime network guarantee of 99.9%, free cPanel migration, and free SSL certificates. It also offers free DNS hosting and management, and domain names are activated instantly upon payment. To get in touch with Netorigin, there are two options: telephone and ticketing system, though no live chat or support email. The vendor’s support team is available round the clock and seems to know their way around most of the common hosting issues that users face. I opened a sales ticket in this vendor’s ticketing system and got a response in just a few hours. Additionally, though the vendor has set up a knowledge base on its website, it is not very detailed. Netorigin’s combination of enterprise-grade SSD storage, isolated containers technology, modern redundancy protocols, and many other noteworthy features has made it a preferred hosting company for businesses in Australia. 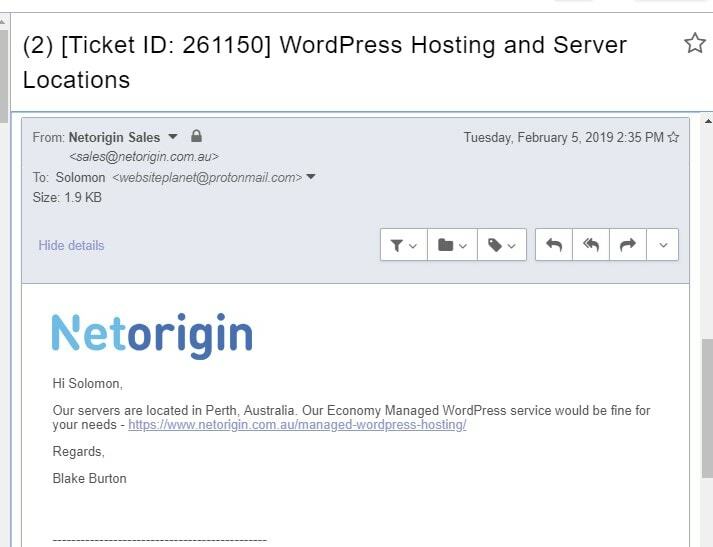 The vendor’s quick-to-respond support team further makes its hosting solutions appealing to businesses of all sizes even beyond the Australian borders. Wondering how Netorigin stacks up against other Web Hosting companies? Enter any other Web Hosting company and we will give you a side-by-side comparison.